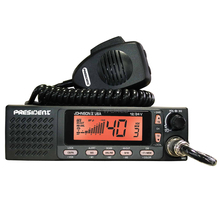 A brand new Deluxe CB radio the President Johnson II features tri-color face plate (Orange, Blue, or Green). The President Johnson II is compatible with 12 or 24 volt systems offering unmatched versatility in the world of two-way radio. The Johnson II from President has a large easy to read front panel LCD display with dual watch, weather alert, key lock, a useable signal meter, up/down channel selection, local & distance switch, 3 memory channels with channel scan. An instant channel 9/19 ability means help is only a call away and the talkback front mount speaker makes the Johnson II a pleasure to listen to even when operating a heavy duty truck or similar equipment! An industry first five year warranty means you don't have to worry about premature electronic failure with the Johnson II. The Johnson II features selectable manual or auto squelch, ANL/NB and hi cut filters for no interference sound, RF gain, front mount speaker and external speaker jack for even louder audio output potential.